Dazzle guests and family members with the modern elegance of these wall-mounted terrariums. Each decorative globe in this set of 2 is made of clear glass and features a spherical shape with a flat back panel that allows the terrarium to hang securely against any wall. The clear glass design allows you to see the items placed inside and makes these decorative jars ideal for displaying air plants, sea shells, tea light candles, and more. 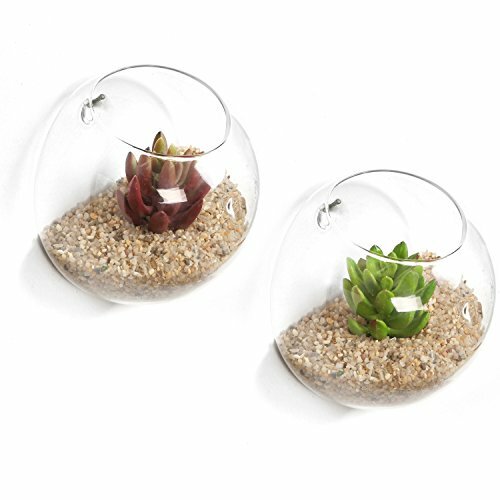 Turn an ordinary wall space into a work of art with this set of 2 glass bowl terrariums. Approximate Dimensions (each globe, in inches): 5 W X 5 H X 3.5 D.
A set of 2 clear glass hanging terrariums ideal for bringing unique, modern style to your home or business decor. Features a round top opening that allows you to fill these terrariums with air plants, sea shells, tea light candles, and more. Attach to any wall using appropriate mounting hardware (not included) and the small, round hole in the flat back panel.